Update: Links to all sources here! 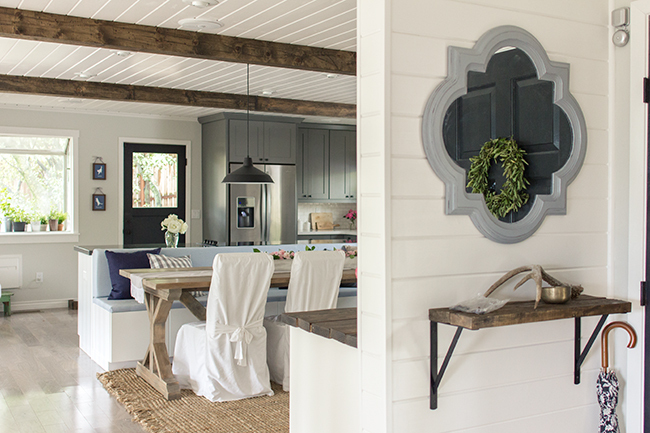 Oh happy day… the kitchen reveal is finally here! I can’t believe it! Five long months of countless hours, days & nights; blood, sweat and tears have finally paid off. But you can’t fully grasp and appreciate how far it has come unless you’ve seen how it looked five months ago. Let’s take a trip down memory lane, shall we? When you first walked into the front door and turn to your right, you stepped into a dining area with a funky 70’s bar. Straight ahead is the kitchen door which goes out on the side deck. Just to the right of that was the very small closed off kitchen. Also from the 70’s. Just so it wasn’t completely closed off, they cut a hole in the wall so you could see your dinner guests while you cooked. How thoughtful. I knew the second I walked in that the wall needed to be taken down, and the entire room gutted and reconfigured. We didn’t waste any time. 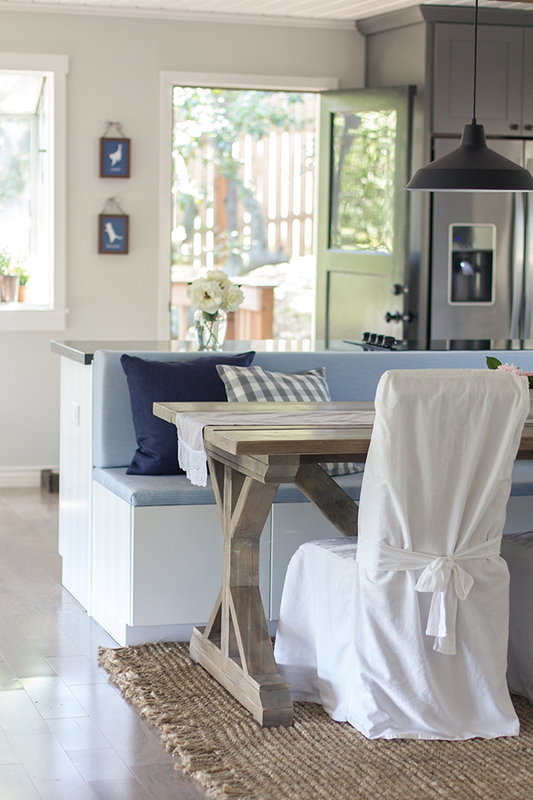 We worked with a kitchen designer at Lowe’s who helped us find the perfect setup. 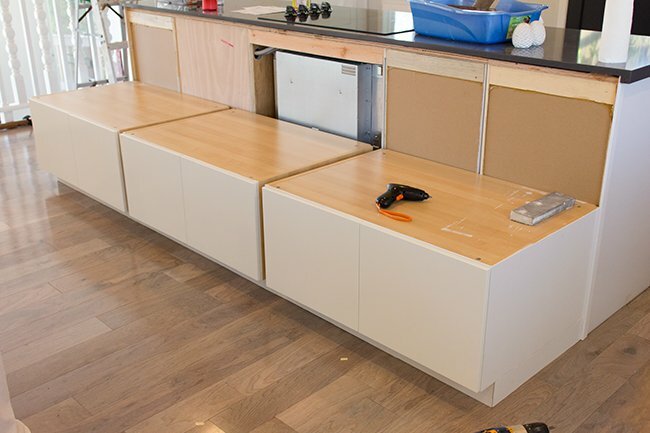 I also supplemented the storage by making a pantry, bench seating, and a bar using Ikea cabinets and wardrobes. 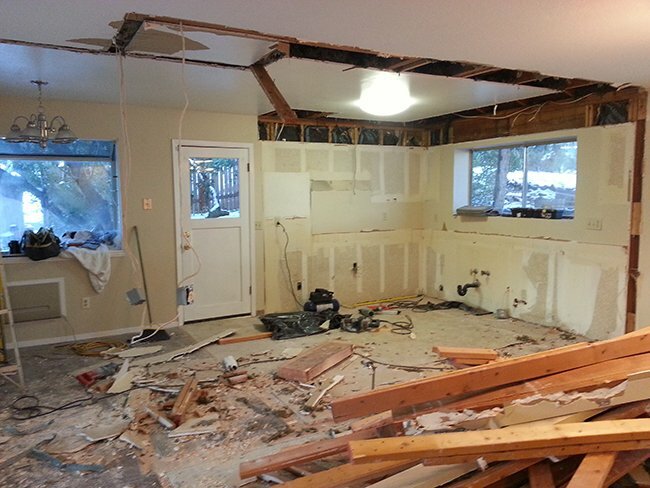 Every surface was ripped out, rewired, new drywall, new floors, new electrical and plumbing, you name it. And so much more. There were lots of struggles and setbacks along the way, but we survived and now we’re able to enjoy this space with friends and family for years to come. I appreciate all of your encouragement and thoughts along the way—thank you for following me on this journey! Thanks to my parents for letting me raid their property for all the pretty pink flowers this afternoon. Aren’t they gorgeous? I made this no-sew table runner last week with a couple yards of fabric from Joann’s, some ruffle trim and hem tape. The flower box was super simple—a 1×4 cut into pieces, secured together with wood glue and my nail gun, then painted/sanded/stained. 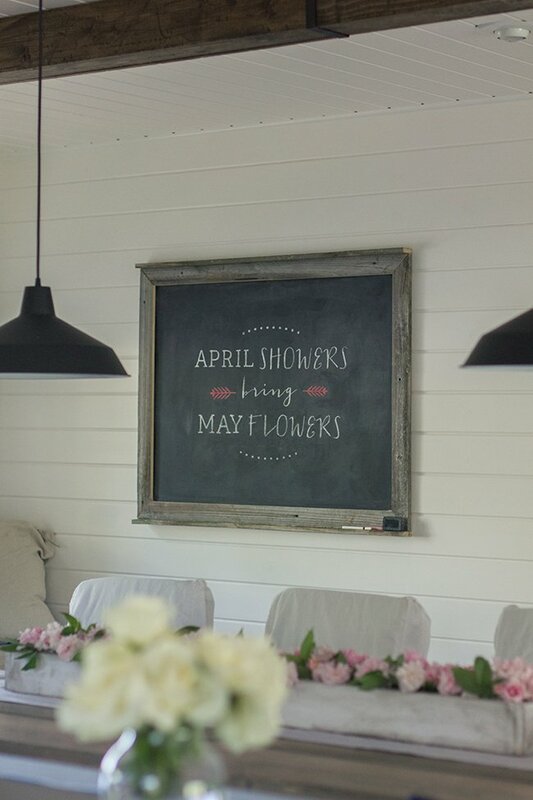 The chalkboard on the back wall was a last minute addition, and it’s one of my favorite things in the room. More to come about it in a future post… (hint: a giveaway is involved). I’ve also decided to become a botanist. Okay, not really. But I did start an herb garden, and after managing to kill all of our plants in FL, I’m determined to keep these babies alive. And cook with them. 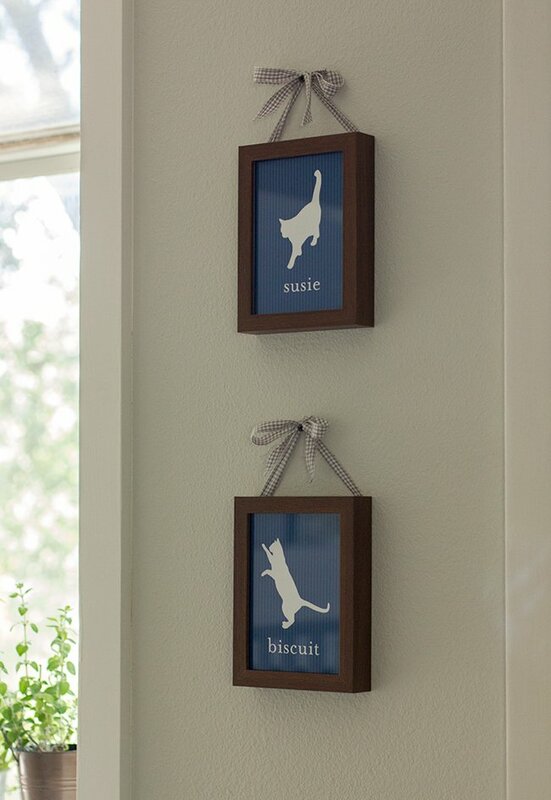 Biscuit and Susie also have a little spot for them here. I made prints of their silhouettes (you can get them for your furbabies at my shop), framed them in cheap Ikea 5×7 frames and stapled some scrap fabric to the back for a little extra specialness. I also built them this food/water station yesterday out of scrap wood. They seriously love it. They eat like 5x/day now. 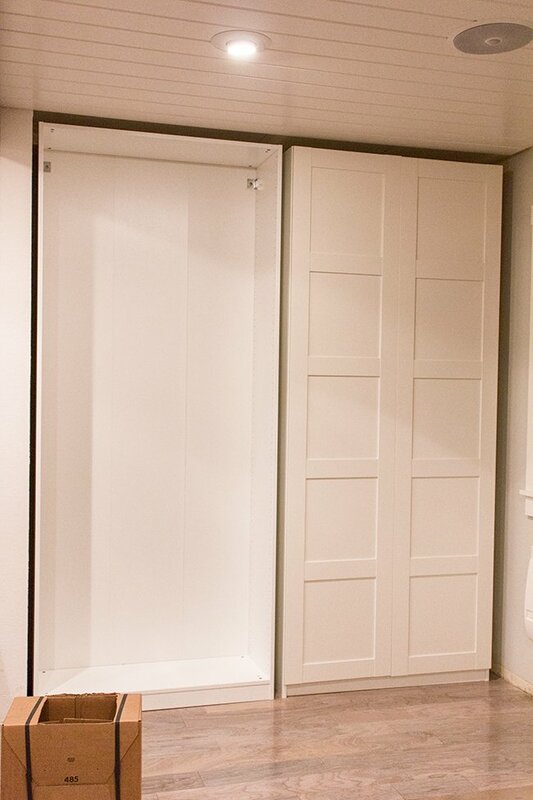 Still loving my Ikea wardrobe/pantry cabinets. So much storage. Still also loving these appliances in the island. No cramped cooking here. I kept the color palette to whites, blacks, grays neutral brown/beige/ivory tones, and navy blue. This way I can easily switch it up throughout the seasons. Good thing there’s lots of seating to curl up onto. And thank you guys for weighing in on the bamboo blinds situation. I changed my initial choice after reading through the comments and went with the medium tan/brown. I think it was the right choice! 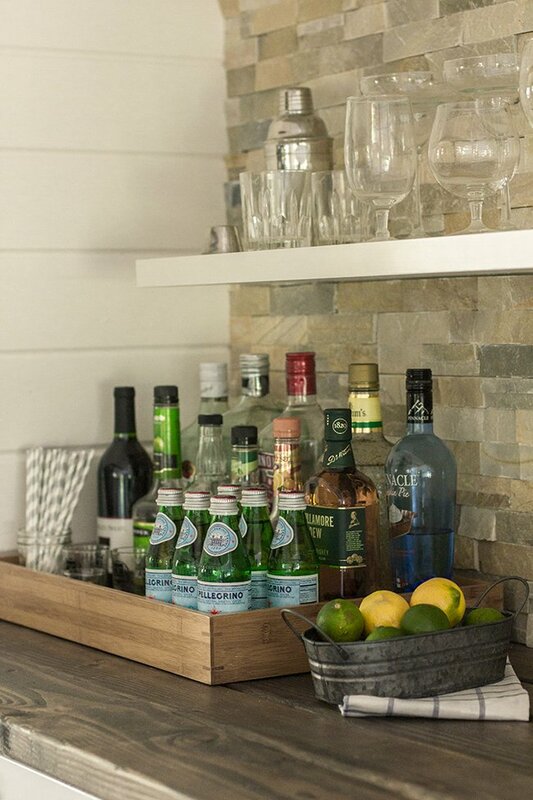 Our bar is stocked and ready to entertain. 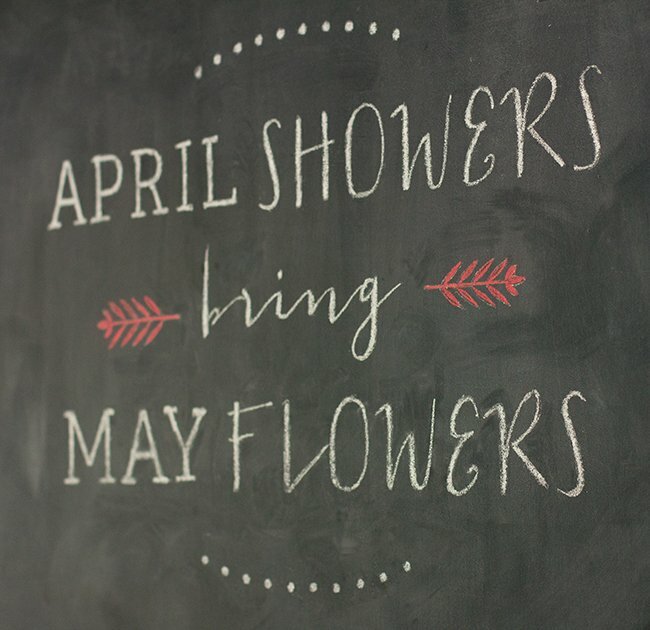 Which is a good thing, because we have guests coming from Florida on Friday, and a big housewarming party next Saturday. I’m excited to test it all out! Here’s a shot with all the lights on. 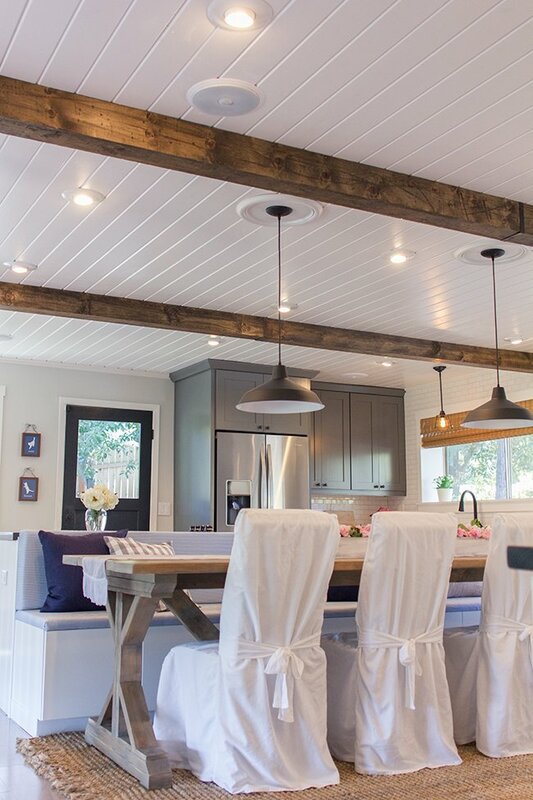 There are 13 recessed lights, one pendant over the sink, and two pendants over the dining table. I’m mildly obsessed with these pendant lights. And that’s the story of our kitchen. We tried to get them to sit next to each other and pose. It didn’t last long. She chooses the most random places to plop down and rest. I can’t seem to find my wide angle lens that I used in the before’s (I haven’t used it since those photos, and now I’m freaking out a little because it’s apparently missing…) so I did the best I could with my 24mm lens. Also, the wide angle lens makes the room look a lot larger than it is, so the new photos are a much better representation of size and scale. There was a wall here before… not anymore! Hopefully that helps to clear up any confusion! Kitchen Chronicles: The cabinets & floors are in! Kitchen Chronicles: Ikea Pax Pantry Reveal! Don’t worry, I have a full source list AND price breakdown coming up. I haven’t even started to add it all up yet so this should be… interesting. We’re currently on our way to San Francisco to pick up our friends from the airport and will be celebrating our birthdays this weekend, but I’ll stop in Monday with the source list/budget breakdown. There are no words, it is truly stunning! Perfect! What a joy to live in! Congrats! What an amazing job! I love it. It is tranquil and love the table, pottery barn? You guys did a great job. 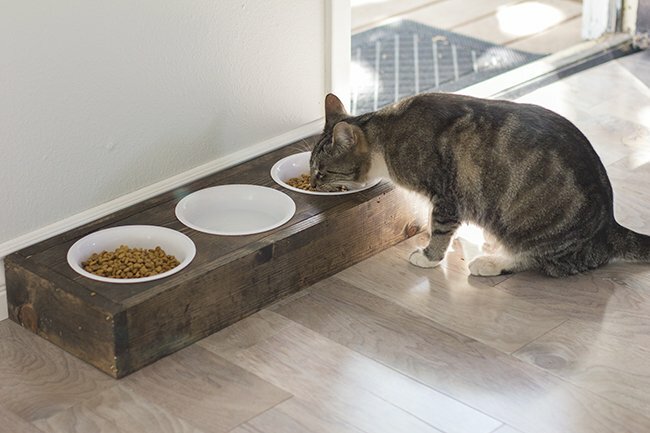 What talent to make the cat bowl holder too! I don't have a whole lot of time to read blogs, because… well… we have a thirteen-year-old boy and a two-year-old boy, and that spells BUSY. But… I honestly have been popping into your blog numerous times a day, hoping that you'd JUST GET THAT KITCHEN REVEAL PUT UP ALREADY! (So if you have seventeen thousand blog hits from Small Town, USA, it was me. But… I promise… I'm a fairly safe blog stalker, because who has time to get serious about it, and I've never looked good in a dark trenchcoat and shades.) ANYWAY… I'm rambling. 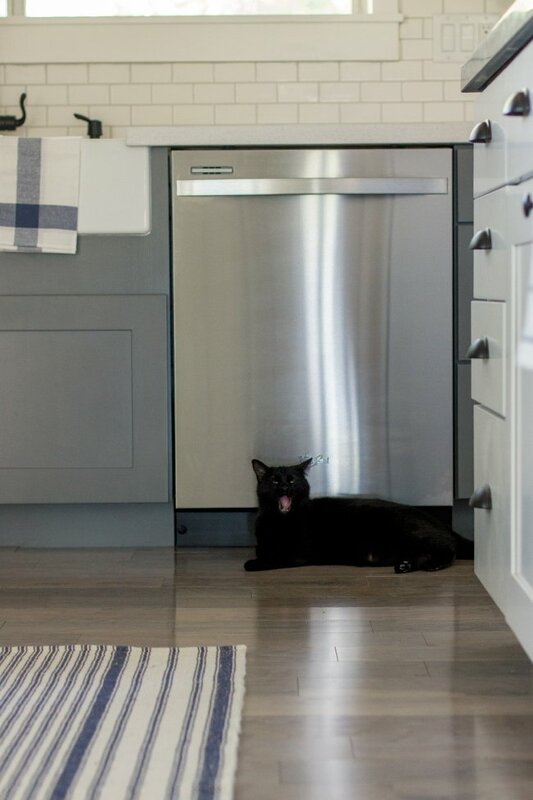 What I wanted to say is that if you heard some piglet-like squealing this morning, it was just me… realizing that I could finally see your kitchen in its entirety. And… I LOVE IT!! 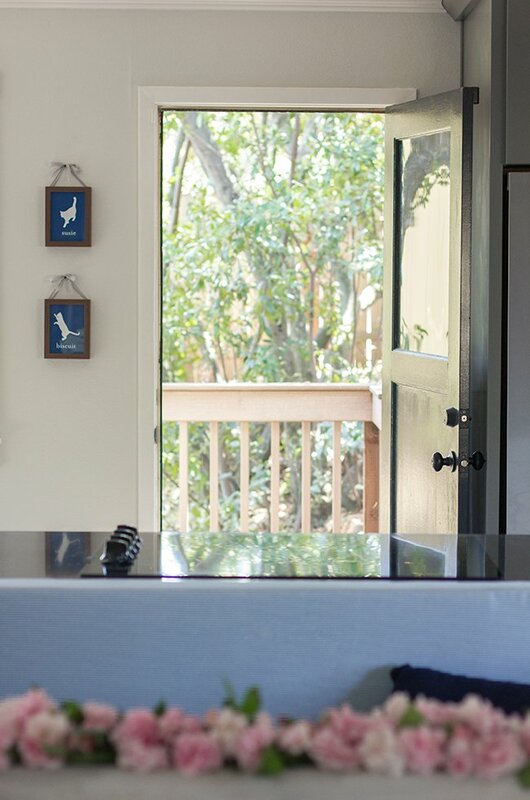 I think this is the best kitchen that I've ever seen in Blog Land. 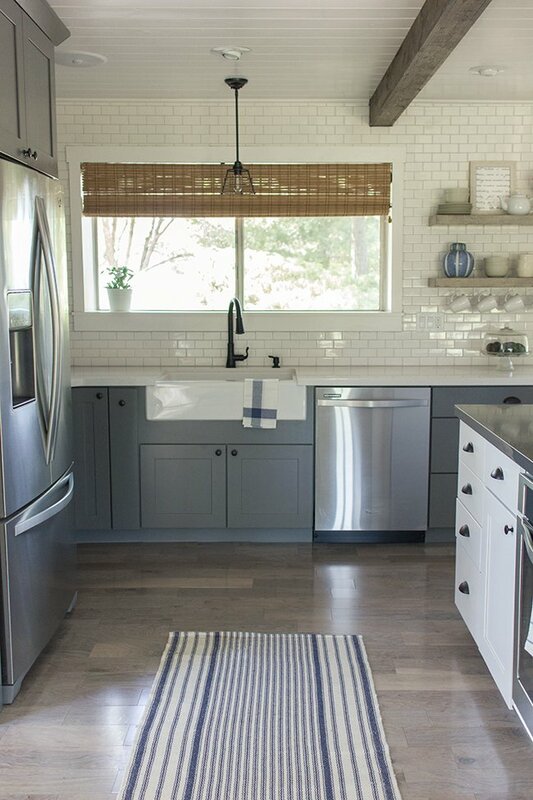 Your gray cabinets had me at Hello. We built our house five years ago, and our kitchen cabinets are cream-colored… and now you make me want to rip them all out and put new gray ones in! 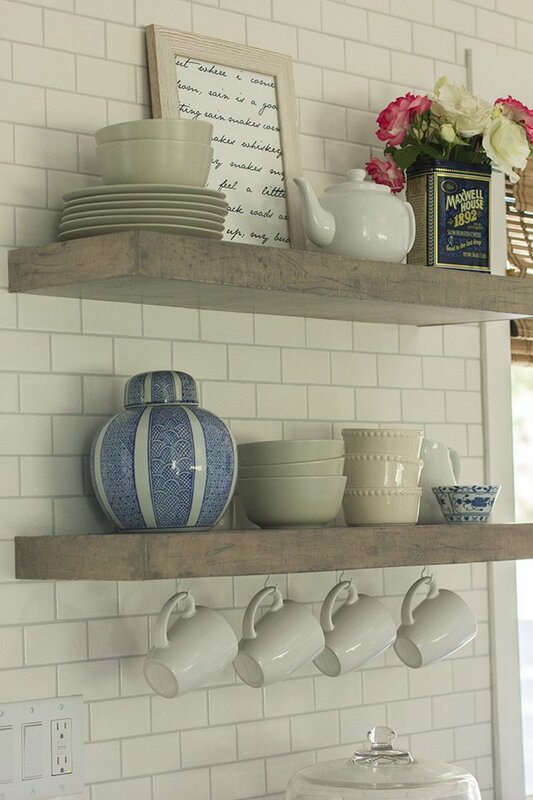 And now I want open shelving, like yours… There's just too much in your kitchen that I covet! I love it. You and your family have done a fantastic job on this kitchen. If I was your neighbor, I'd pop over this afternoon for a cup of chai tea, while you make a boxwood wreath for me for MY front door, because even though you made THAT PROJECT look easy… I would fail it. My spiritual gift has just never, ever been decorating. So… all that to say, Congratulations on finishing up the greatest-looking kitchen I've seen in years! Love it! You guys did such a great job, what a wonderful space to have for cooking, entertaining and gathering. 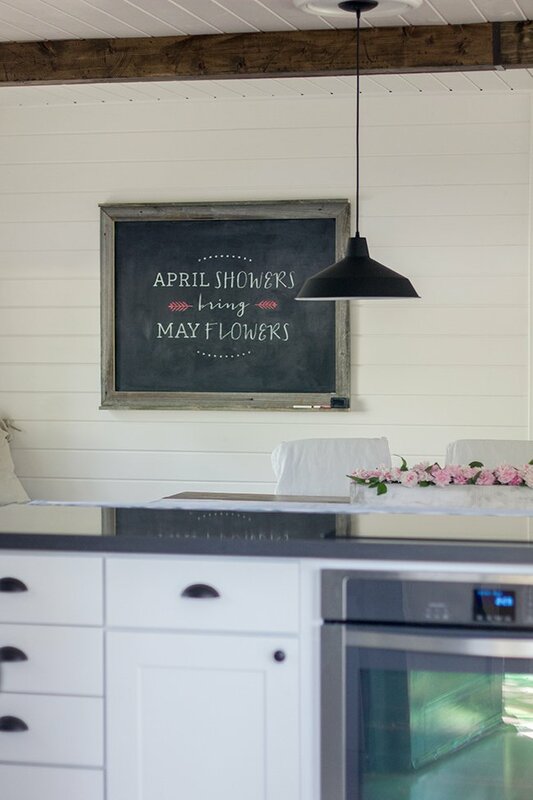 I can't believe it's been 5 months in the making, watching it come together on the blog it seems like it's been faster then that, but I know when you are living without a kitchen it feels like forever! Congrats on an awesome kitchen! The whole space is absolutely stunning. It's beautiful. looks amazing! Y'all did a great job! Jenna this post has left me nearly speechless…. your new kitchen is BEAUTIFUL!! I SO LOVE THIS!!! 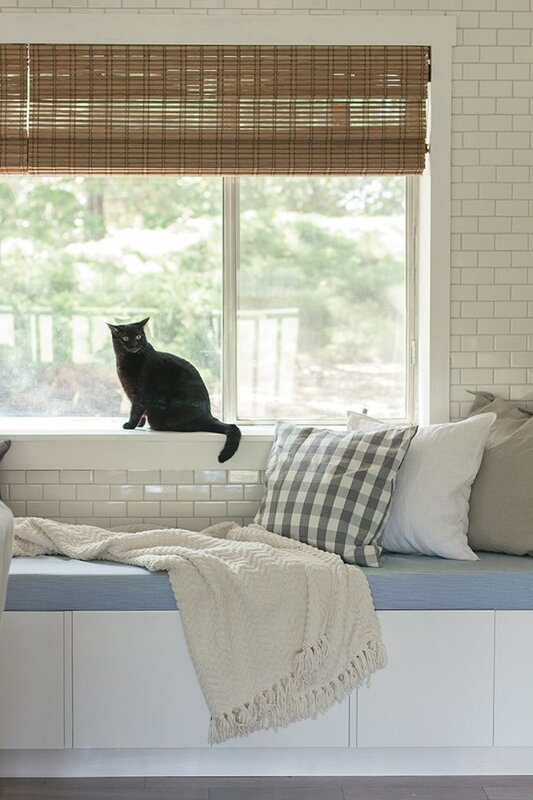 Such a design inspiration and I'm dreaming of a space like this someday!!! It's so beautiful I could cry!! I can't believe it's been 5 months! It went by so fast! Says the girl who had no hand in it's creation haha! You should certainly be proud of your work! We built the table from scratch. I am a completely converted follower of your blog, have been since your move. I can't believe how much you have done, and how beautiful the outcome is! You've really got vision, which is a gift. So…enjoy it! Hope the big party is fun (I bet you'll LOVE entertaining in your gorgeous home now) and take some deserved time off! 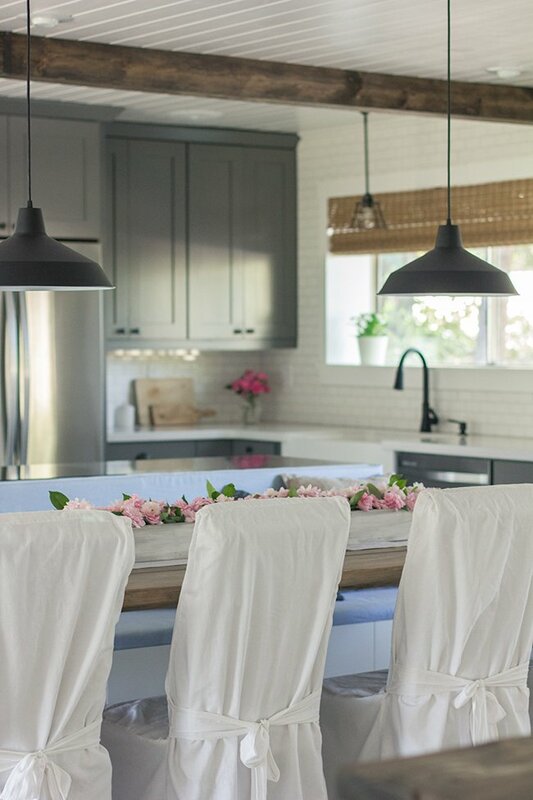 The pink flowers are to die for in all that serene neutral and navy! Swoon worthy…. so much hard work and it turned out to die for! Absolutely love it!!! Can you share some pics from the same angle as the before pics? I love the detailed shots, but I'd love to see a shot of the entire room. Amazing. Seriously, no words because every single detail is amazing. Congratulations. I have been following you since before you bought the California house – I can't believe it's been 5 months. What a beautiful kitchen! Your style is amazing – very peaceful and relaxing. Fantastic job! The kitchen is absolutely beautiful! I love the colors together and the bar area is lust-worthy. I love reading your tutorials and you always have such great pictures. I can't wait to see what you do with the rest of your place. 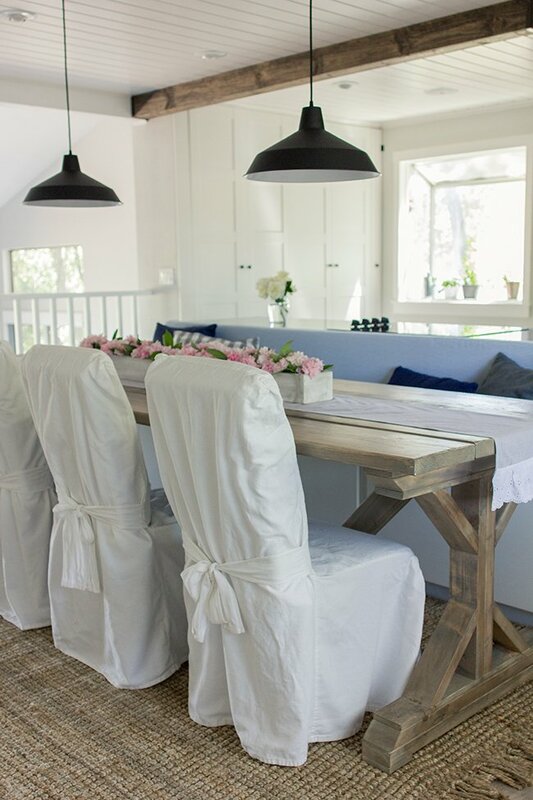 rustic yet refined, well done! 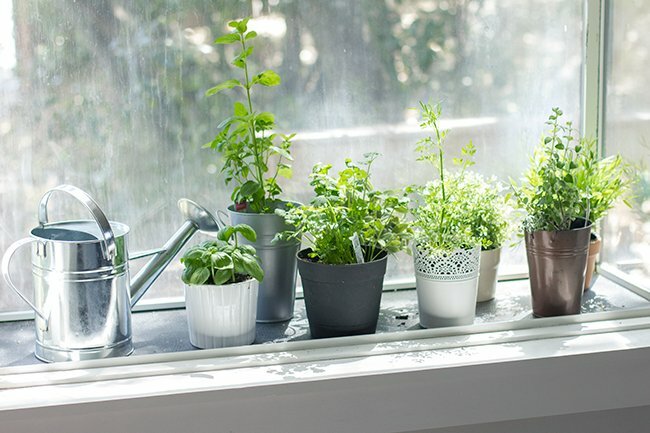 i envy your sunny window for an inside herb garden! Your kitchen is amazing! I've loved watching all the updated on how it came together! Absolutely Incredible!!! Please, please, please share a video tour…. I need more!!! Beautiful job! It's been fun following as you make this house your home. Congratulations. This is an amazing transformation. You've worked your way up to my favorite blog! 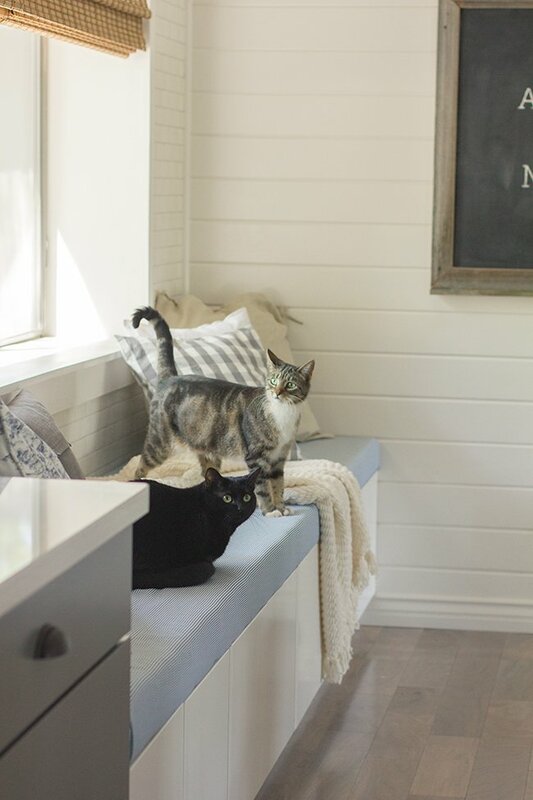 Thanks for sharing your renovations, they're very inspiring! Jenna – everything, the finishes, colors, everything is just fabulous! And you're right, it's all very relaxing. What a vast difference from where you all started, too. Keep up the good work….can't wait to see what you all do next! Fabulous! I Love it all so much! WOW!!! everything turned out amazing!!! you guys did such a great job! love your choices for all the finishes you picked! can't wait to see what you guys do with the rest of the house!! have fun! and happy birthday!! Beautiful! But do you have any more pulled back shots like in the before? I'd love to see as much of the whole room as possible in one photo. Gorgeous close ups though! Truly stunning! I made my husband sit through this and we all know how much they love doing that 😉 but it was just so amazing I had to share it with someone. Looking forward to seeing the rest of the house transformation now. Seriously impressed! Brava! Well done!! I love it! I've been reading throughout the process and can't imagine how exhausted you must be! The outcome is gorgeous though. 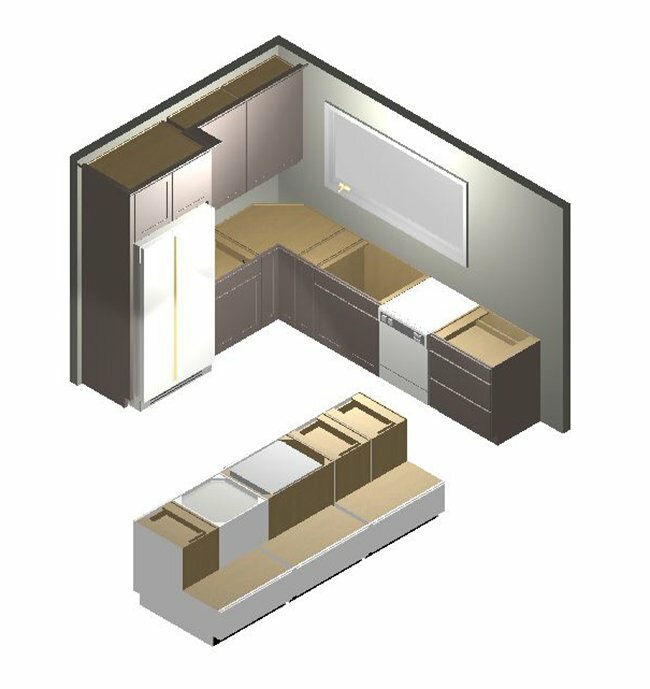 Thanks for all the great ideas – I'm thinking of doing the same pax pantry when I can finally one day remodel. I have been reading diy blogs for some time, but just stumbled on yours. This is my first post, and you bet I will be back. The before and after is amazing! I love everything about your new kitchen. Looks like I will be clearing some time in my schedule over the next few days to catch up on the archives! Wow, great great job! Love it all. 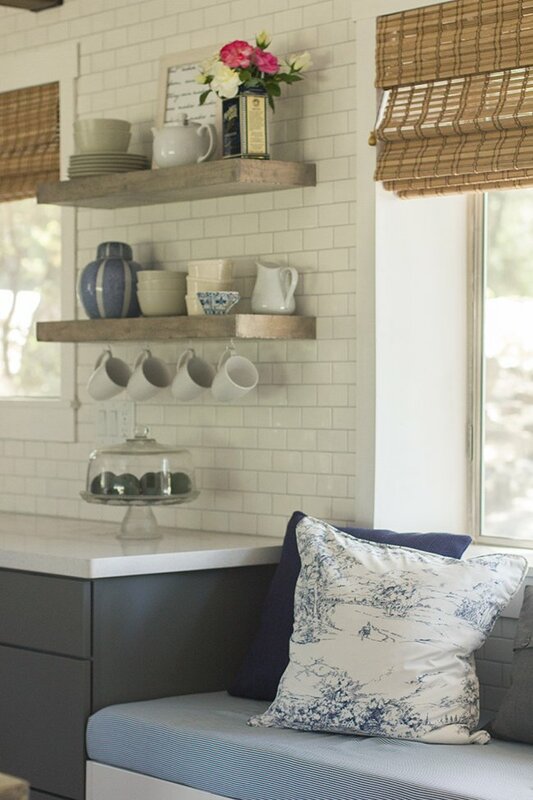 As someone going through a DIY kitchen reno, this post is super inspiring. And because it bears repeating, wow! 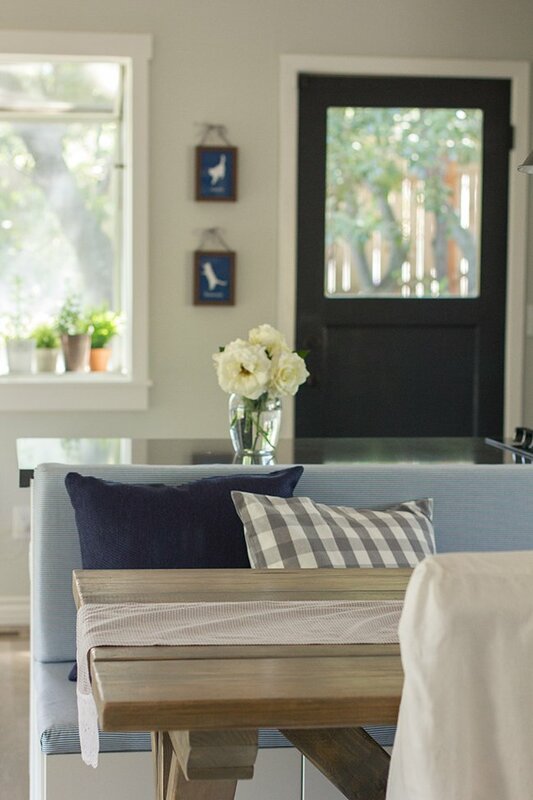 I just found your blog and just wanted to let you know how beautiful your home is. I spent an hour reading back to when you decided to move and began your house hunt. Your vision is amazing and the rooms you are creating are simply gorgeous. I can't wait to see what you do next! Absolutely stunning and I hope you get to rest a little before your company arrives!! GORGEOUS. You guys did such an incredible job. Love everything about it!! Oh my heavens!! Just beautiful!! Been following you for 2 years!! Thank you for your blog!! Truly a successful transformation of this space. 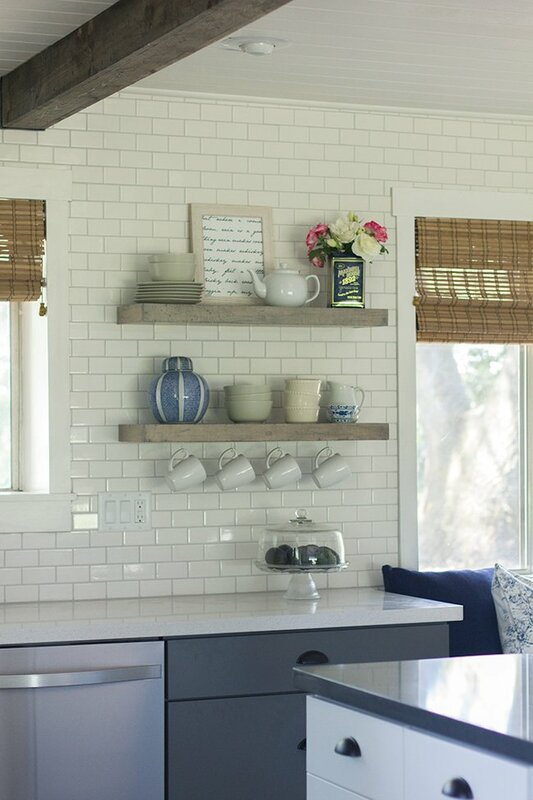 I love the combination of the charcoal cabinets and the white walls. I can appreciate the food station you have built for your pretties, I am sure they love it as well! GORGEOUS! 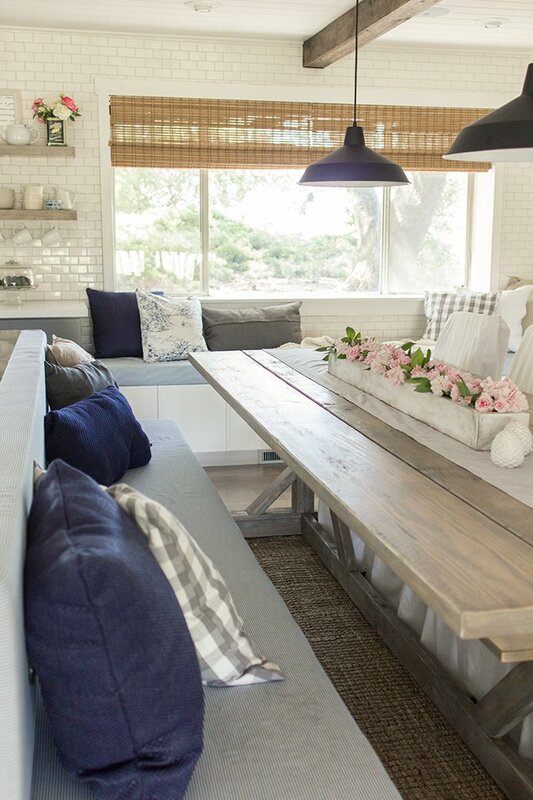 It's so calm and relaxing, and it looks fantastic for entertaining. Kudos. Beautiful as always! Your hard work paid off and now you have an amazing room to enjoy. It's so beautiful. But I didn't expect any less. Our styles are so similar, but you are able to pull them off, so I live vicariously through you. 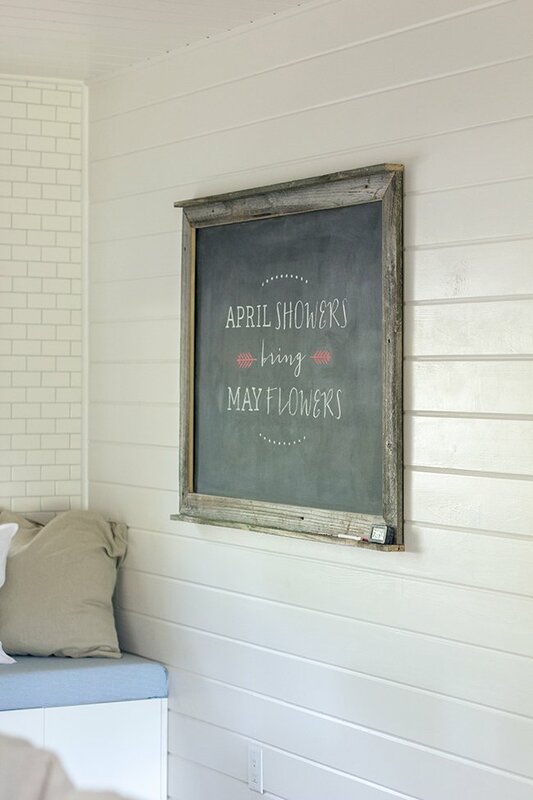 Can't wait to continue following you through all the rest of your DIY home remodeling/restyling! Jenna! this is AMAZING! I've been following every step and you absolutely *killed* it! Major kudos to you guys! I was bummed when you decided to move from your sweet little Florida house, but I've got to admit that it's great fun to see everything you do to this new place! I've learned a lot from you! Keep up the great work! It looks amazing! I love alllll of it. 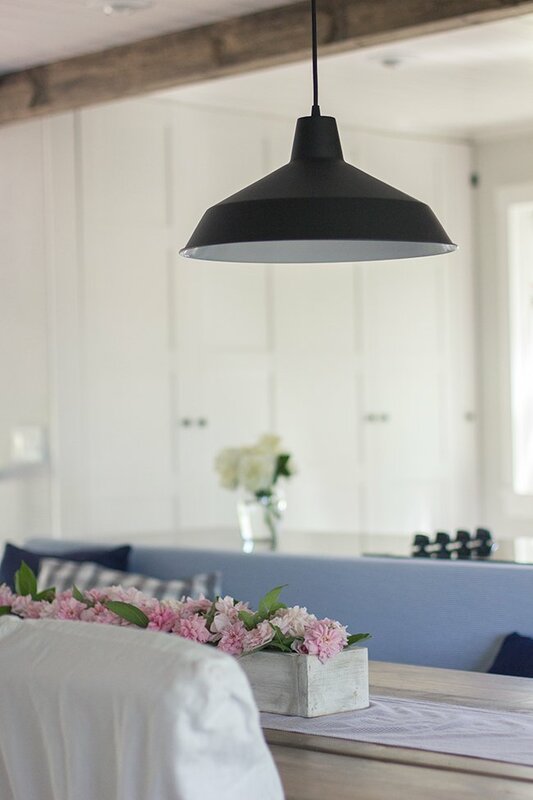 Quick question – did you decide to forego a range hood? I ask because we just removed our upper cabinets over our peninsula and were planning on putting up a ceiling mounted range hood but I love how open our kitchen is now without it. I was thinking of skipping it altogether but didn't know if it was something people did. Would love to hear your thoughts! That CANNOT BE the same room. It is so gorgeous. It is like a whole new house. Worth every penny! Wow! This is lovely. I hope you're proud of your work. Your vision for the space is really impressive and that is such a brave undertaking. Well done!! 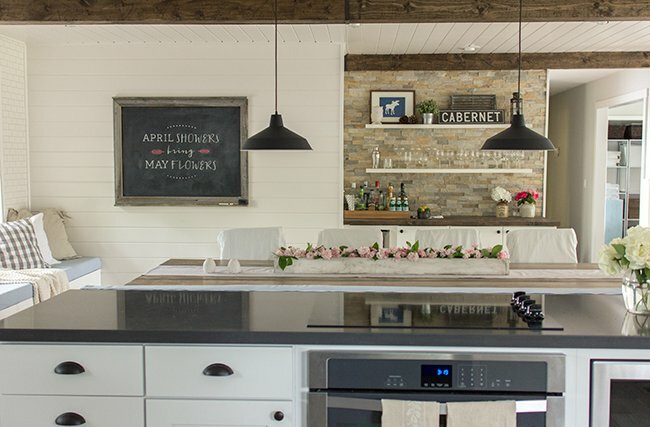 OMG I about fell off my chair looking——DROOLING—-over these kitchen photos. What a transformation. 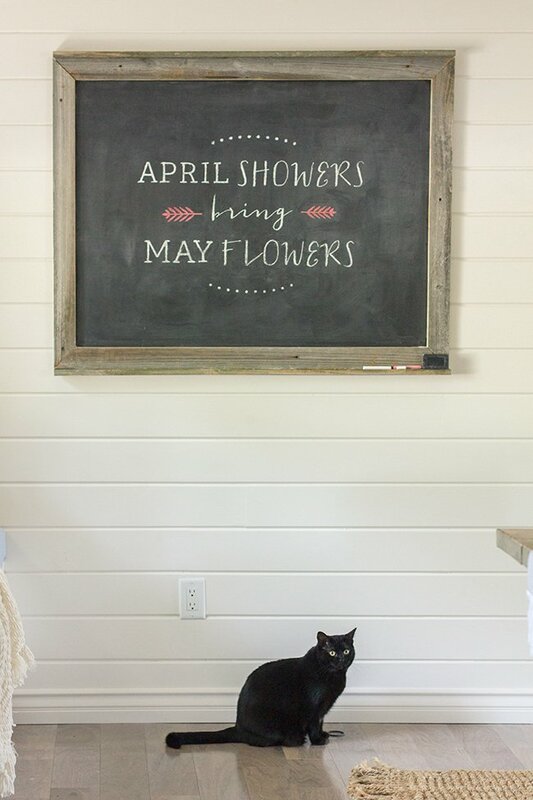 I love everything about it – especially the kitty bowls!!! I know you will enjoy this space for many years to come. 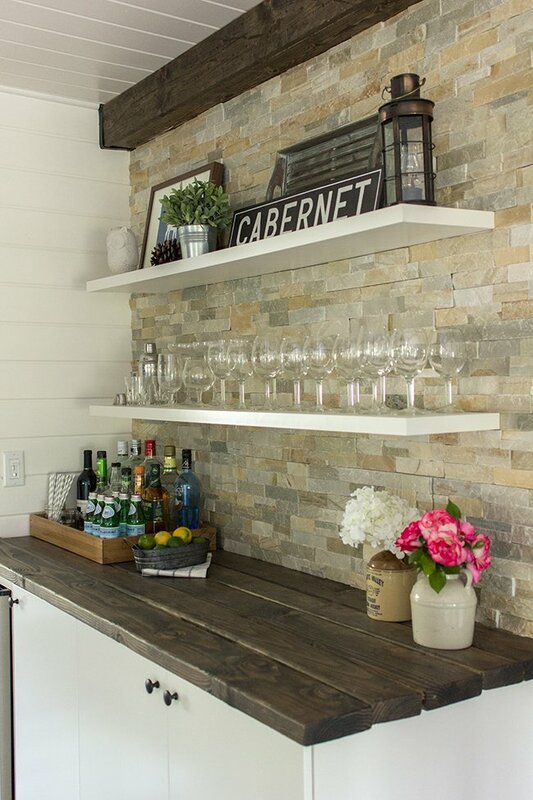 Congrats on completing your dream kitchen – and sticking to your vision!!! Really a phenomenal transformation! Wow! You guys knocked it out of the park. I can really tell the thoughtful detail and professional designer input that you used in this process – the results are so professional and inspiring! LOVE it! I really can't get over how far the kitchen has come! I've been following along for months, but it was really nice to see it all summarized again. 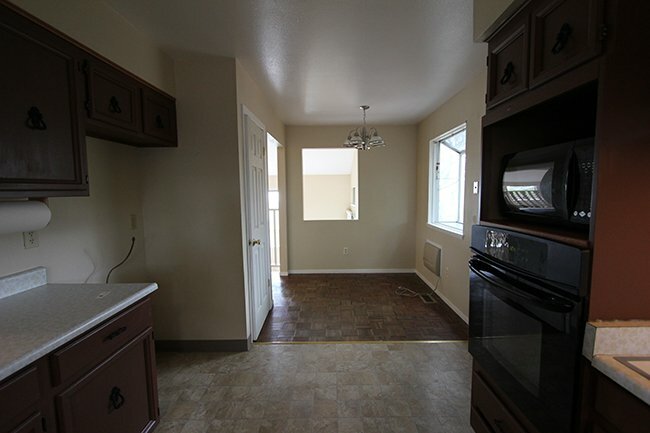 We are in the process of buying our first home and my first project will be our kitchen, although, I don't think we will be able to do it ourselves the way you guys did and I'm actually a bit jealous that I won't have the same satisfaction that I imagine you must be feeling! (Husband, not handy, self, 6 months pregnant). 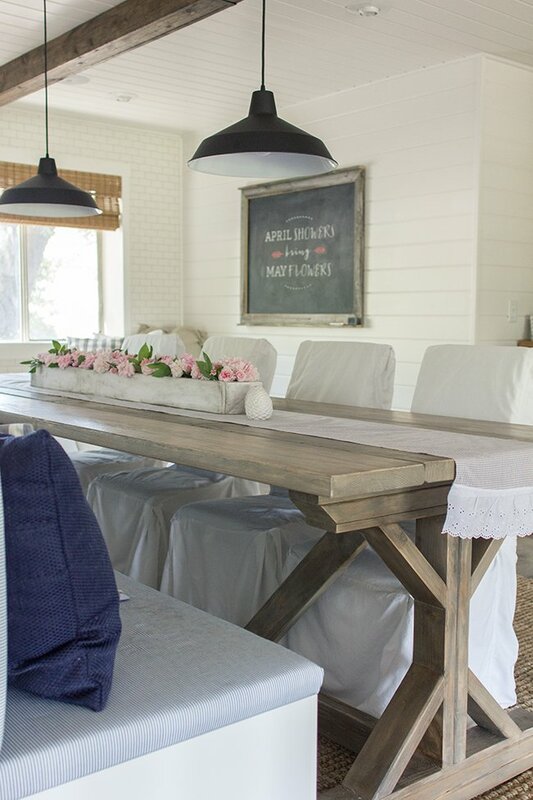 I am really anticipating seeing your budget breakdown – I think it will be really helpful to us when we start speaking to contractors and making decisions on our future space! Thank you so much for taking us on the journey. Thanks Alexandra! Yes, we ended up not needing one. The range is in the center of the room so it would have been awkward, but also because the room is so open to the house and there are lots of windows and doors nearby, it's really not necessary for us. We haven't had any issues with smoke/steam/smells so it was a good choice! WOW!!! 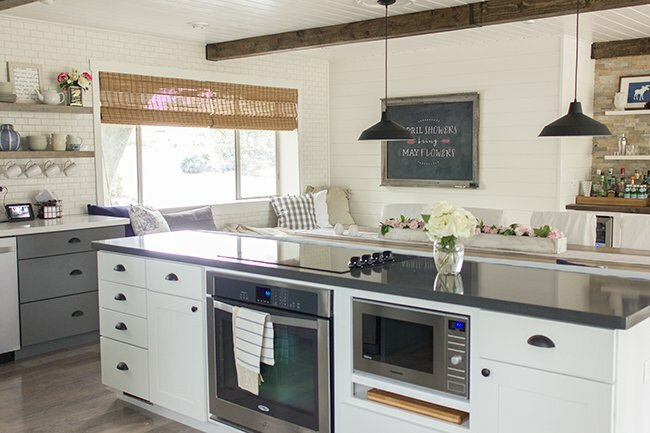 I've looked through this post like 5 times just to marvel at the beauty that is your kitchen! Kuddos to you. Seriously, both the planning of the space and the aesthetic of the design are both just amazing. I'm in love. And totally jealous. The only thing I'd be worried about is getting the bench seat dirty from cooking at the stove. I always have splatters of sauce and oil on my backsplash but maybe you guys are neater cooks then I am 😉 But I guess it's worth it for the design! Looks incredible!!!!!! Wow. After buying some artwork from you 18 months or so ago I just stumbled back to your blog via Centsational Girl. 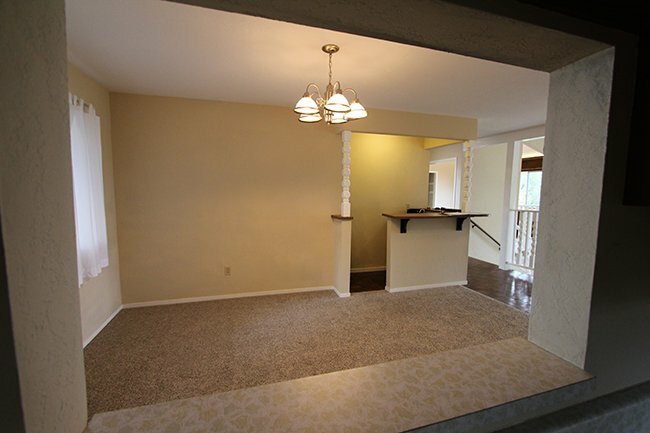 What an incredible amount of work you've put into transforming this part of your home. It looks absolutely stunning. Can't wait to sit down with a pot of tea and look back through your blog. 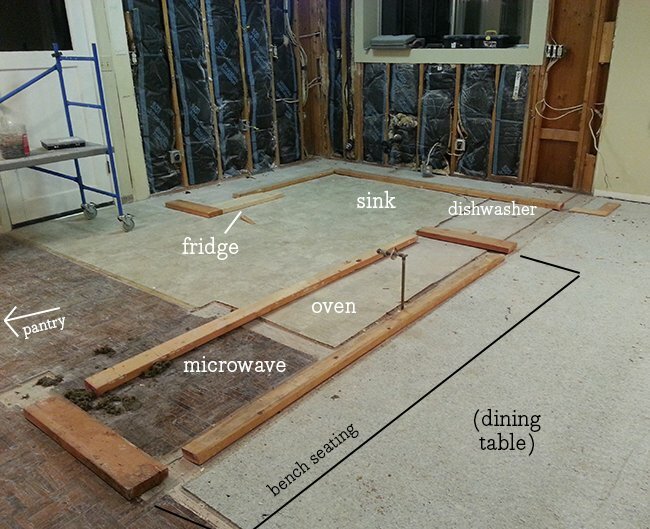 We started rebuilding our kitchen 3 months ago. It's now in a usable state but we have all the finishing details still to do. Can't wait until it's finally all done. Just updated it with new photos! Wow wow wow wow wow. You have done an amazing job on this kitchen. 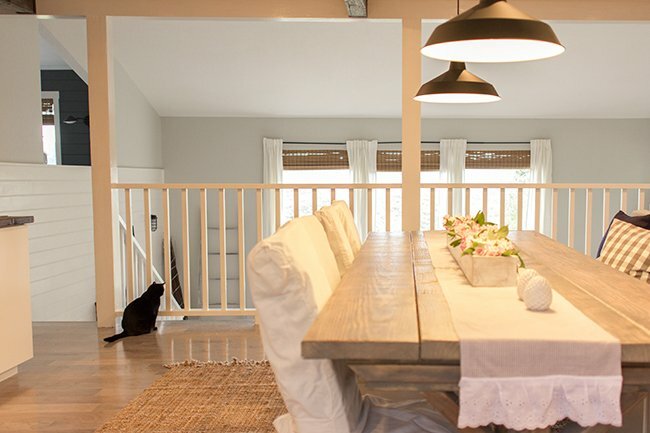 So spacious and light and airy but with lots of warm rustic touches! Gorgeous! Absolutely stunning!! 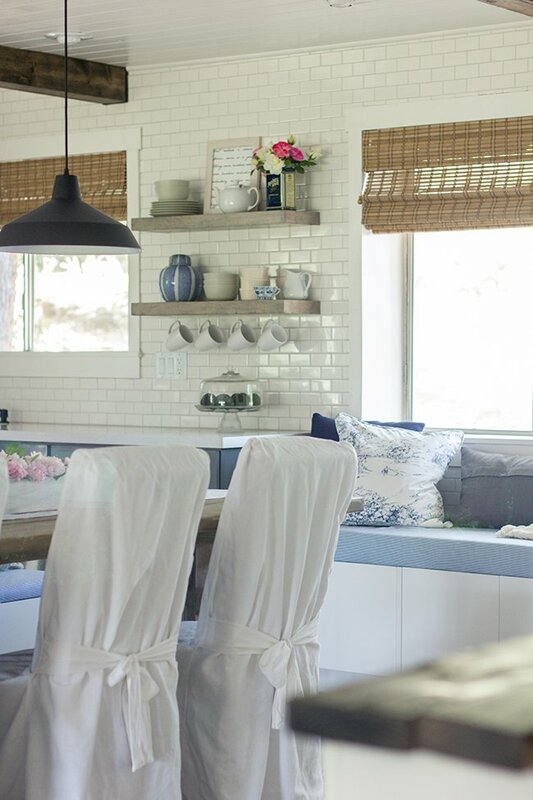 I love every detail in this kitchen – beautiful! Love it!!! I'm a regular here on your blog therefore I know the kitchen has come a long way!!! Great job! You guys killed it! So in love! 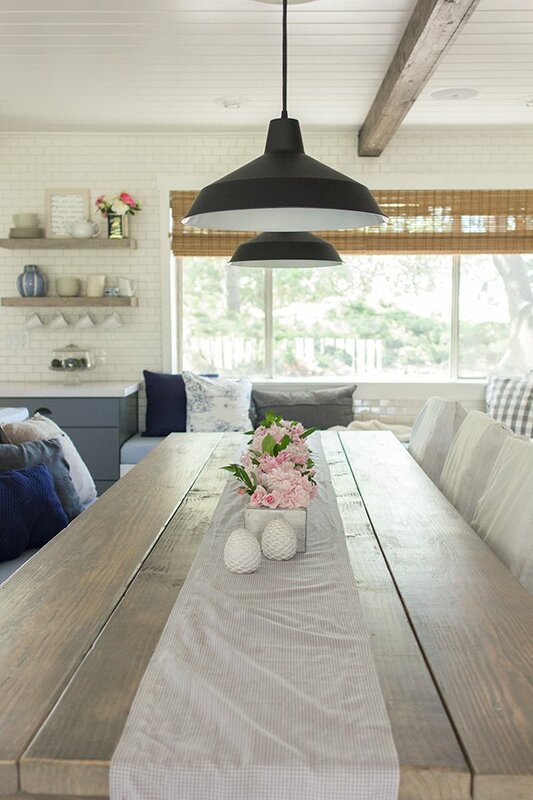 Especially love how the table and bench seat turned out. Your kitchen looks great! With all your home renovations, furniture building/redoing, what tools (power tools and otherwise) do you own? We will be being a house soon and will need to start buying those types of things and I don't know where to start. 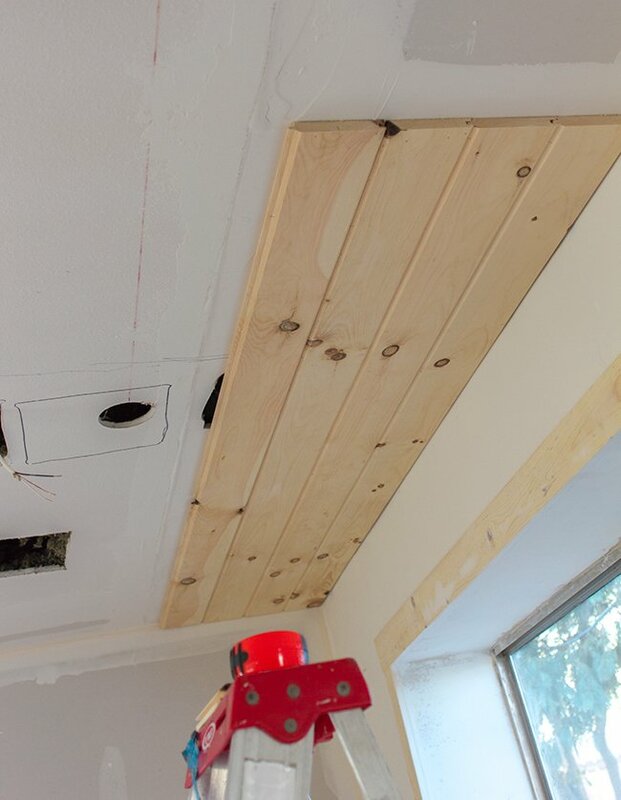 I've used every power tool known to man in a shop setting but am unsure of what will be the ones we would use time and again for home renovations and other projects. Thanks! Great question! The smaller hand tools are used most often (screwdrivers, tape measure, pliers, hammer, crowbar, level, etc). We definitely use our drill the most (a good driver and drill bit set is crucial). We also have little hand-sized cordless drills that are convenient for lighter duty jobs. Aside from that, our miter saw has been essential for nearly every project, and our pneumatic nail gun is also used a lot. Other good ones to have around is a hand sander or belt sander, and a jigsaw. Those are just the basics but it also depends on the type of job you're doing. Hope this helps! You shall use pure black colours for cabinets which will match the sink tap too. This is just my way of thinking. It will look so attractive. What a difference! Sometimes you have to wonder what they were thinking back in the 70's! Amazing! It looks fabulous. Perfect…. It’s been over 10 months since I’ve remodeled my kitchen and the compliments received from my family and friends just keep coming. I hired the team at Classic Kitchen and Bath in Illinois because they are a family business and have been around for as long as I can remember. 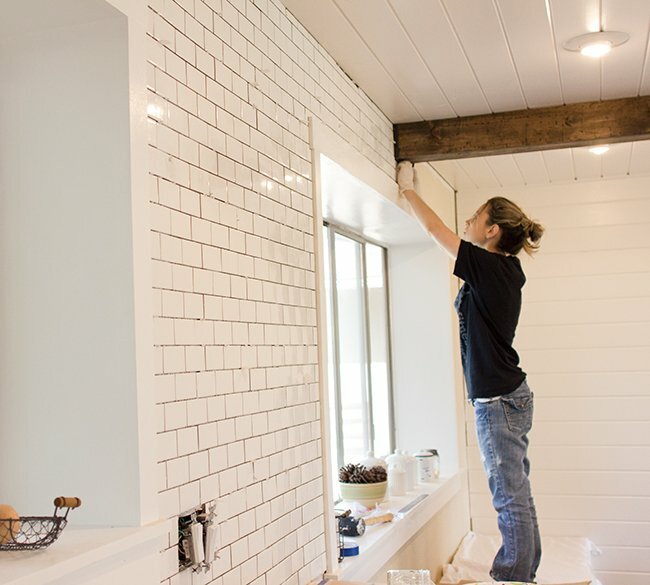 Remodeling can be quite a hassle but these guys made the process much simpler for me. It was a great experience working with the team at CKB- a company that prides itself on quality workmanship, timeliness, and customer service. Visit their website today http://www.myclassickitchenandbath.com or call 630-515-9151. I highly recommend them to anyone considering a new kitchen or bathroom. Beautiful inspiration! Wood work is really remarkable. White color gives fresh look. Floor work is amazing. Lighting system is unique. What a huge kitchen. I was just wondering doesn't the food your preparing on your cook top sometimes splash onto the bench right in front of it. I know that when I cook certain things like grease or sauce will get on the back of my oven cook top. Seems a little dangerous with the heat and fabric cushions. We scotch guard the fabric which helps a lot, and use lids or splatter guards when cooking. The heat is definitely not an issue, and we haven't had any spills yet! Wow! 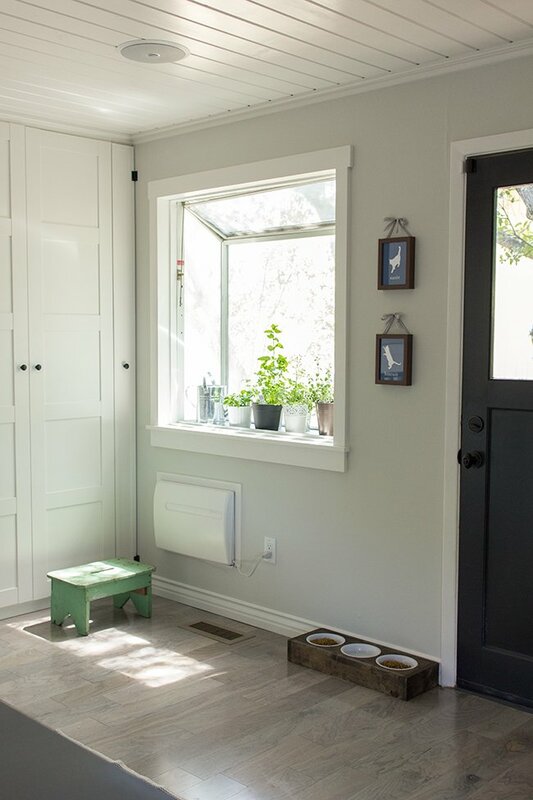 Every inch of this space is perfection right down to the pet food bowls!! Amazing transformation! Sharing on my FB page! Jenna, I know you are putting together a source list but we are in the middle of a kitchen remodel and I need a light over the sink quick. I just love the little cage light you chose. Can you tell me where you bought that? Thank you. Hi Karen! 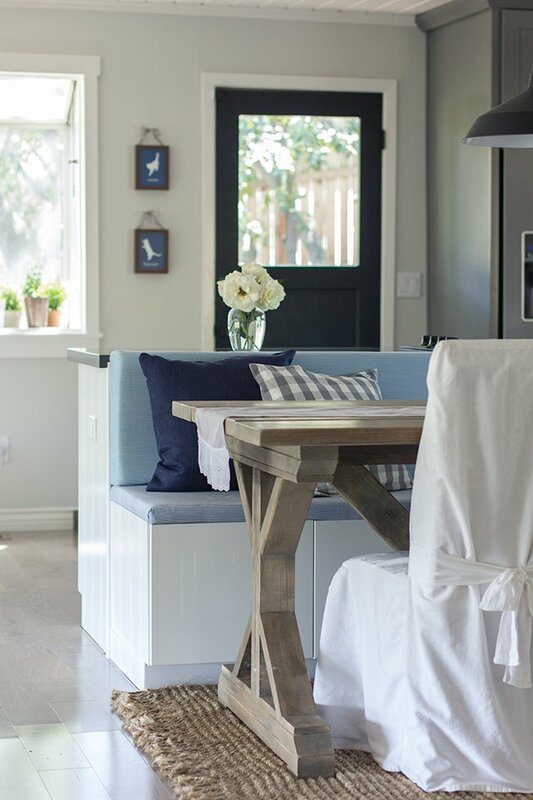 I posted the source list right after this post back in April 🙂 http://jennasuedesign.blogspot.com/2014/04/kitchen-source-list-budget-breakdown.html There's a link to it in there! 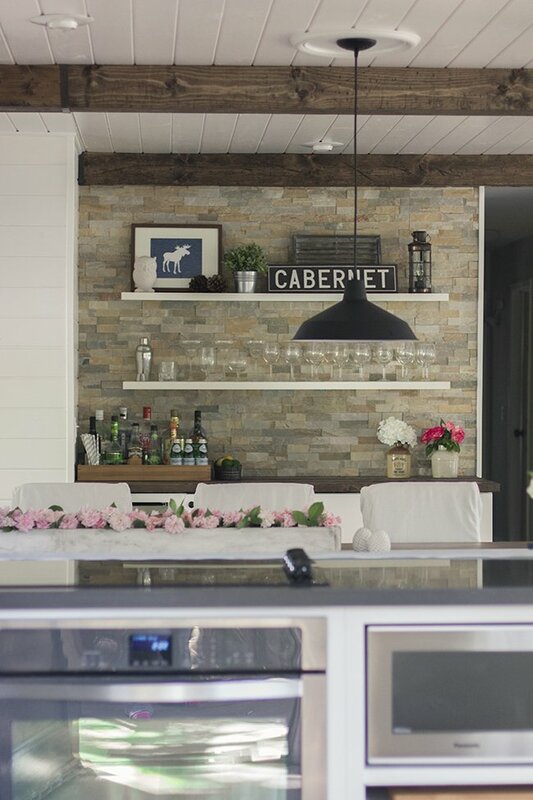 I have been thinking of remodeling my kitchen and have been looking around for inspiration. 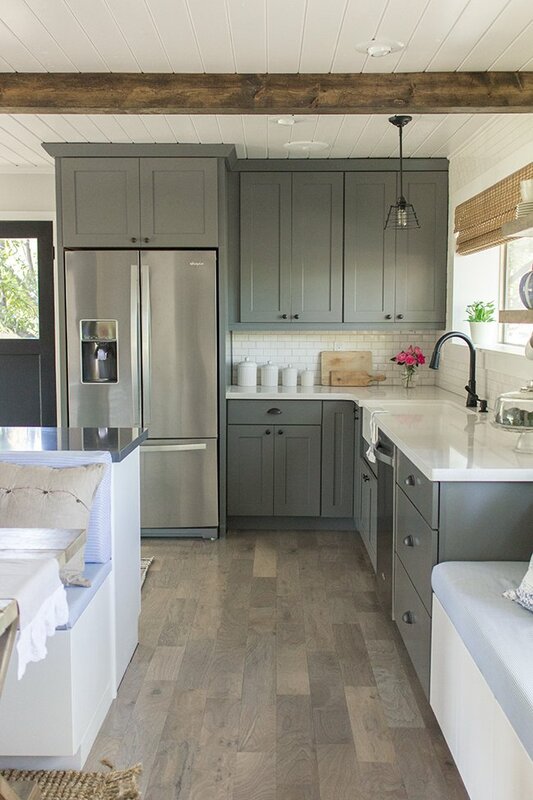 I was thinking about white kitchen cabinets but I absolutely love your grey cabinets. And you wood floors and amazing. Your home looks like a nice place to relax. I love absolutely everything you've done. Great job! I've searched, but maybe im missing it. 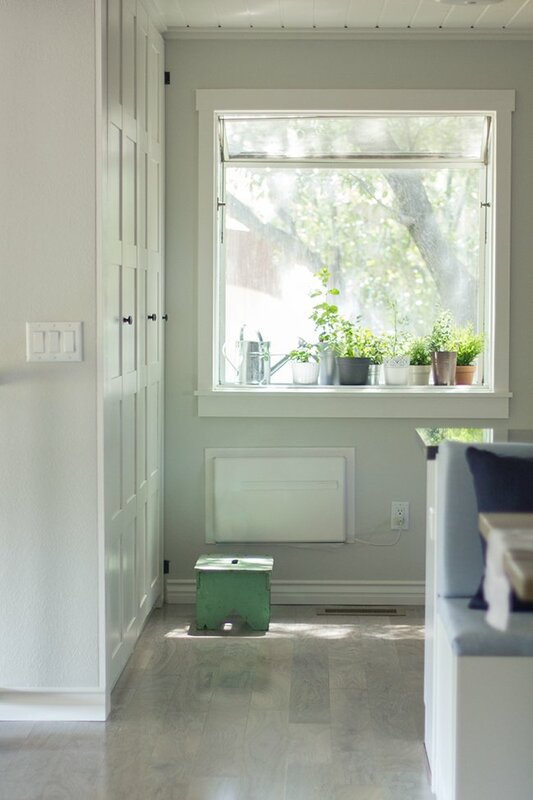 Where did you purchase your bamboo blinds? Stunning! Can you tell me about your kitchen floor, is it tile or wood? Brand and color? Stunning. 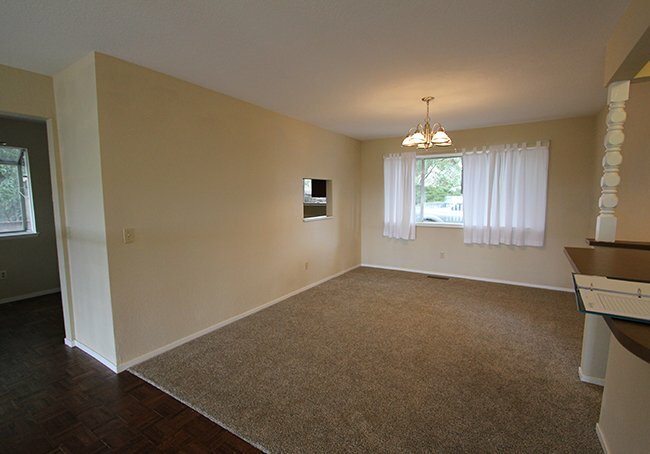 Can you please tell me about the floor? 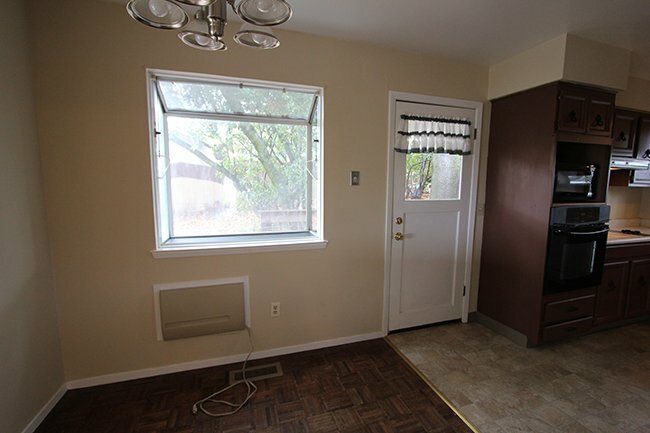 Tile or hardwood? Brand and color? Thank you! 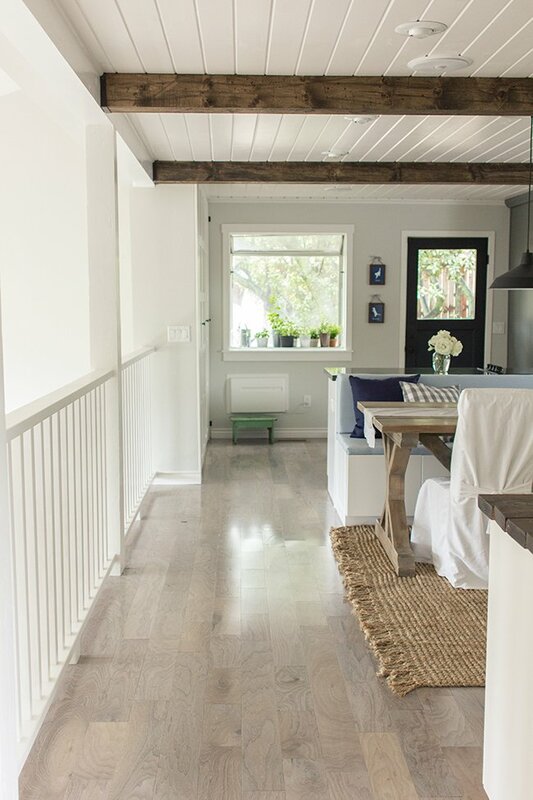 They're Armstrong Shell White Walnut engineered hardwood—if you search the blog for any of those terms there's a few posts that will come up with more info. Hope this helps! I am sorry if this question was answered but what color grey are your cabinets?!? Thank you! Thanks for sharing these amazing images. 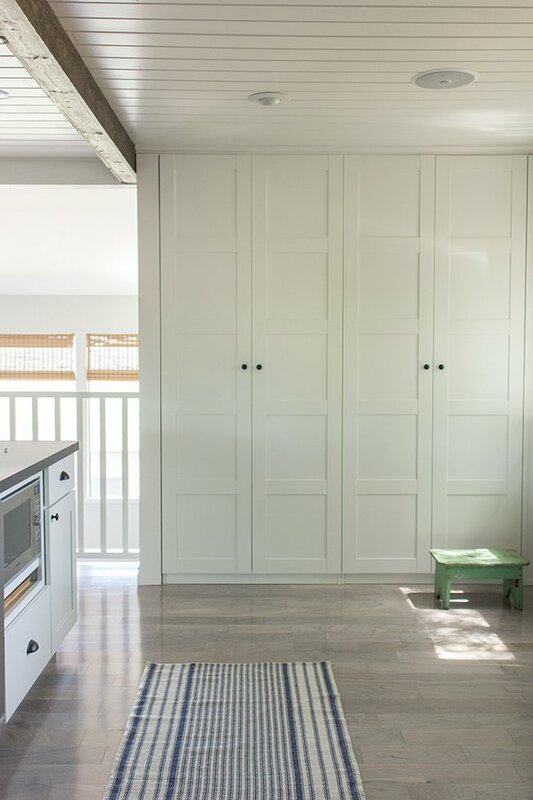 I really like all the images of kitchen you have share, looks great and inspirational. 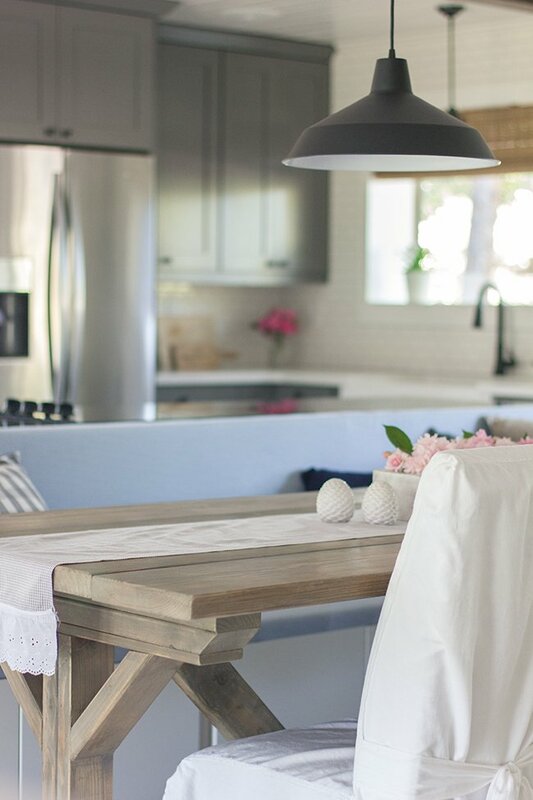 The renovations that you made to your kitchen look amazing and very well done! My parents are in the process of remodeling theirs and they are still in the process of figuring out some of the smaller details. This has some excellent points that I think could really help them figure some of this stuff out. Found your blog on Pinterest. Absolutely beautiful. 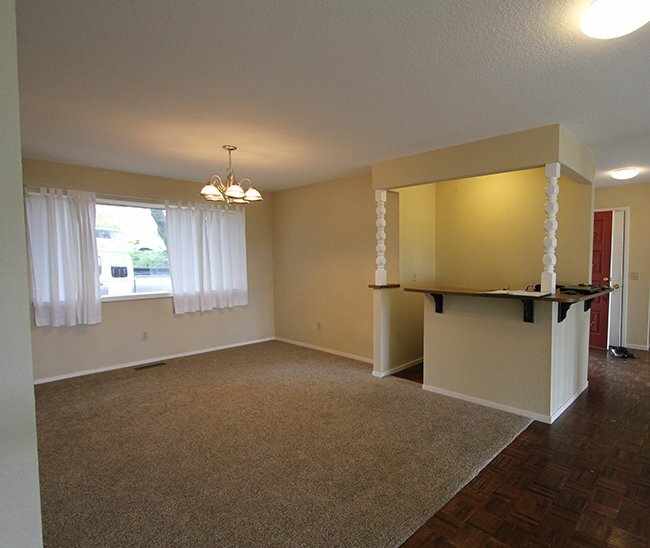 Can you please tell me where you got your flooring and what color you used? Just beautiful. Congrats. Hope you've been enjoying it!!! Awesome renovation…beautifully done!! 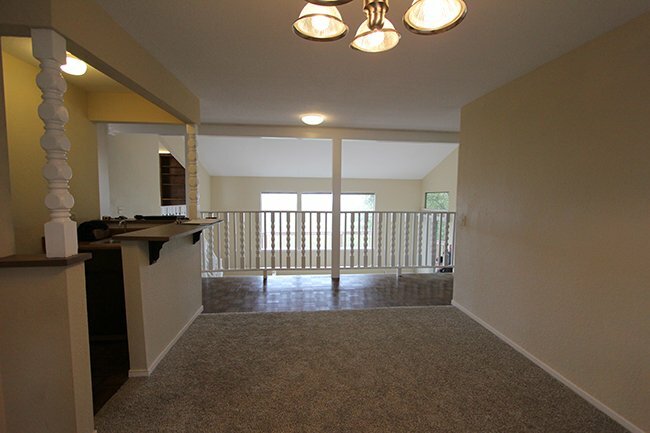 I have a question about the flooring, as I have not read through all of the comments. Is it wood or tile? Once again, you really did a great job. Nice vision! I was actually going to ask if you could post after pictures from the same angles that you posted the before pictures, but I see you already did that! I love the more open space, especially with all those unnecessary walls gone. 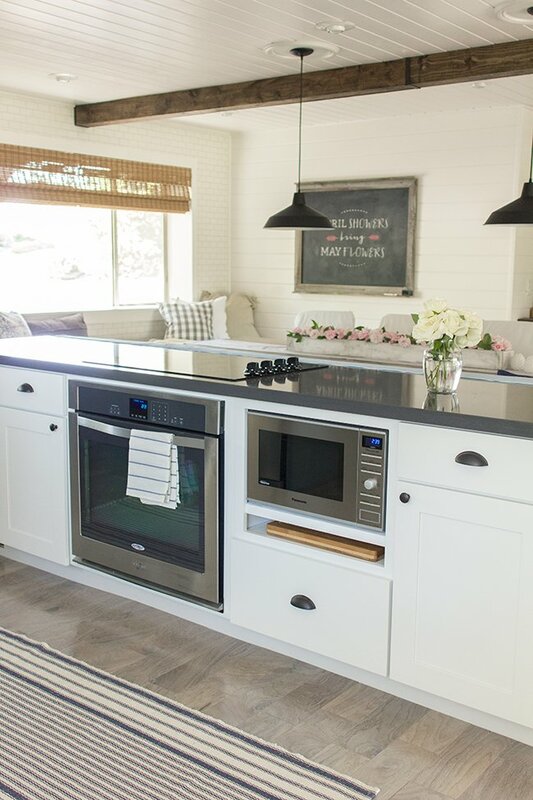 The appliances look sleek and modern, but your decor brings in a little bit of a country feel. 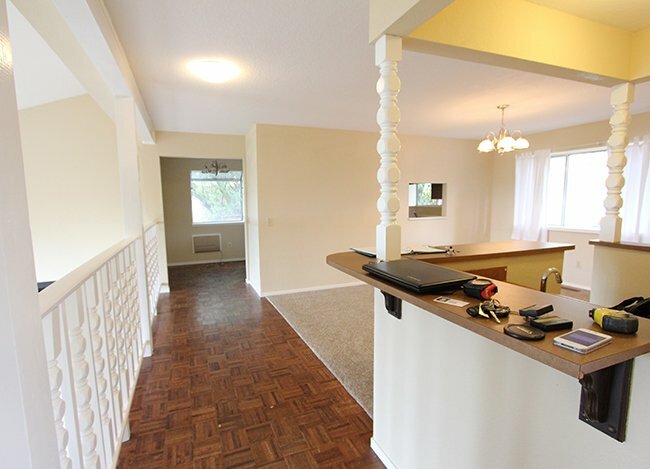 I’m sure it feels great to be able to have more space in your kitchen and dining area! 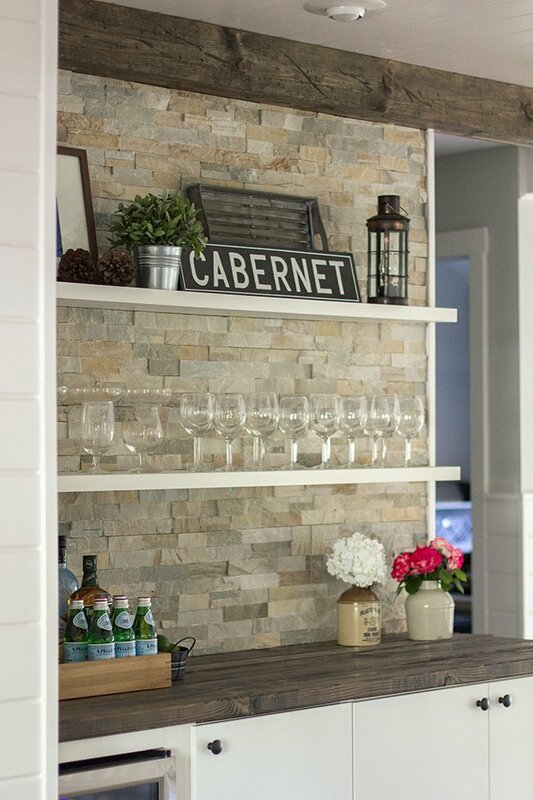 The little bar looked pretty cool, but I like how your kitchen looks now. This would have to be one of my favourite transformations I have seen in a long time. 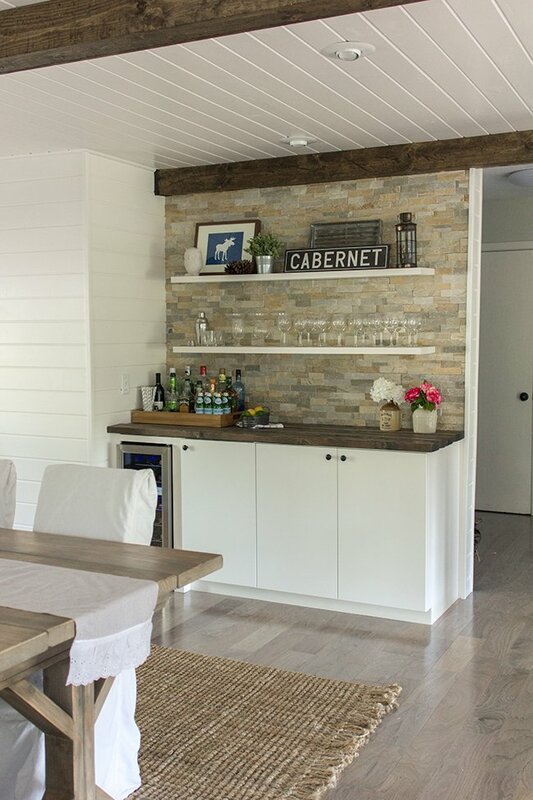 Love the planked ceiling look and the tiles on the wall look fantastic. I thought it might of been too much but the end result looks amazing! Well done. 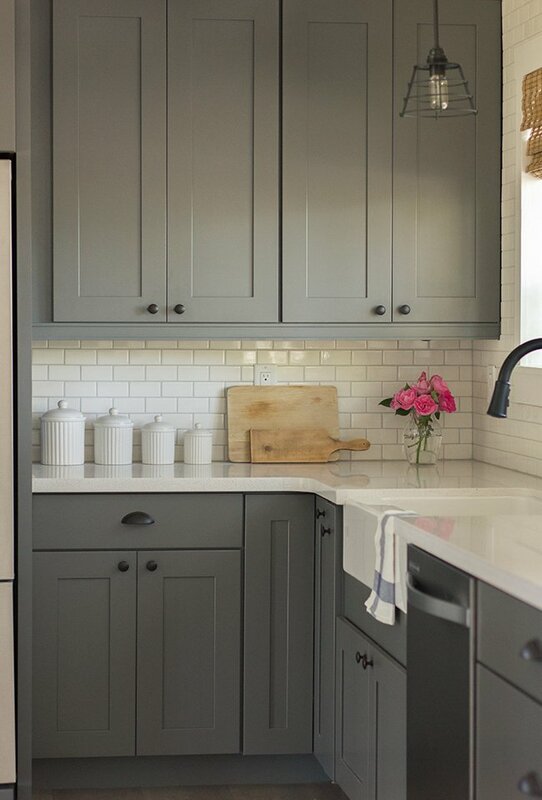 What is the gray paint color on your cabinets? Its beautiful! I can’t seem to find your source list for your grey kitchen cabinets. I’m looking for something similar. I believe the layout of the kitchen is the most important aspect of renovating a kitchen as it determine the place where to locate the huge appliance and equipment. Further, you can consider the fixtures that can be added. Wow, with that much of an an investment, sticking to your budget would be really important. 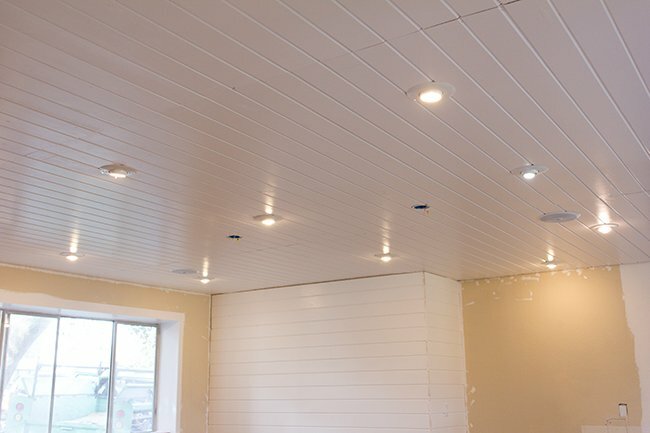 My husband and I are remodeling our master bedroom, so following your example will be really helpful. It is impressive that you handled the demolition yourself, but we plan to hire a professional.Thanks. Absolutely amazing pictures 🙂 I really like the process of kitchen remodeling. great transformation. 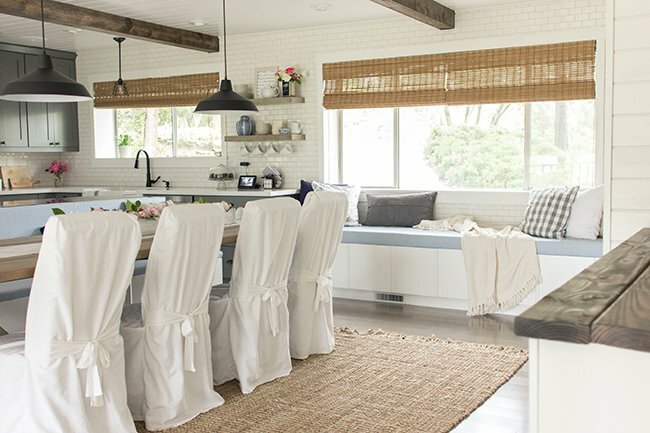 I was looking for ideas that help me to enhance my kitchen style. I understand that colors play an important role while remodeling process but still I like white color as it gives calm and peaceful appeal to our room. And yes, dining room should be spacious just like your room. 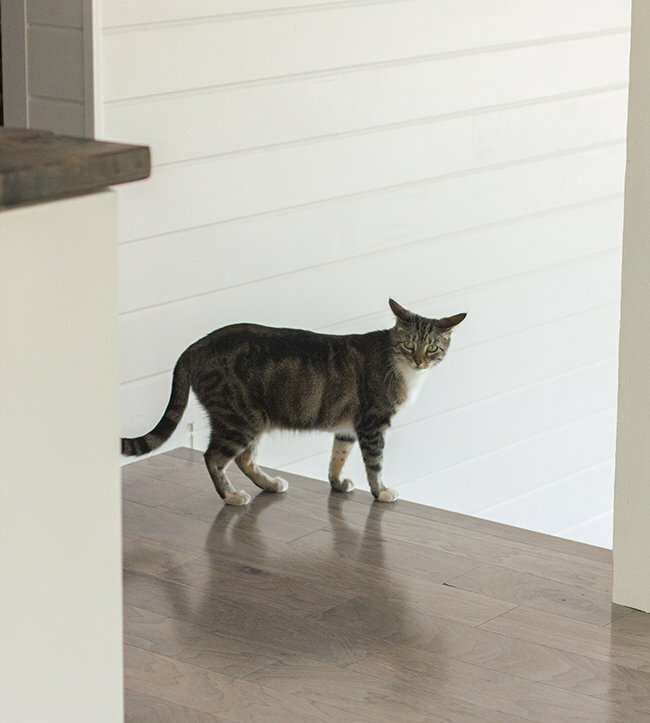 Would you please share information about the flooring? Sorry if I missed it herein. 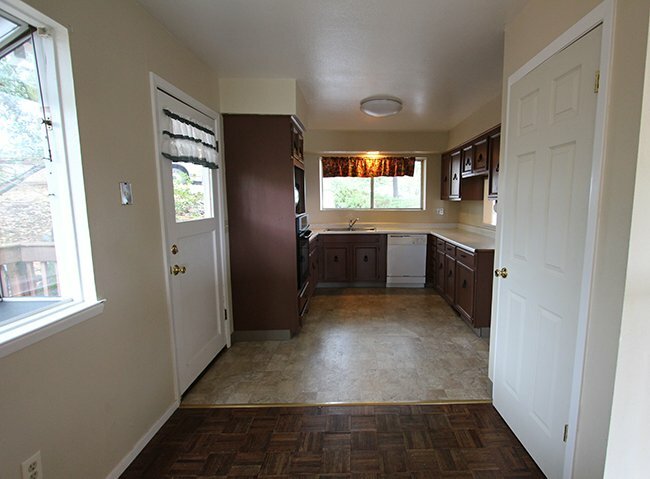 wow….your kitchen is amazing. seriously no word. good job. Really amazing work you have done on your kitchen. Such kind of kitchen renovations can bring complete new look not only to your kitchen but to your whole kitchen.